The coral burst crabapple is a small ornamental tree with pleasant pink flowers and small brown fruit. The coral burst grows well in home landscapes, is quite disease resistant and fairly cold tolerant. But before you plant your crabapple, you should first have your soil tested by your local county extension office. The test results will alert you of any nutritional deficiencies in your soil which should be corrected the year or at least the fall before you plant. Dig a hole that is twice as wide and just a few inches deeper than the container that your coral burst crabapple tree is currently growing in. Set aside half of the excavated soil and mix it with an equal amount of a 50/50 mixture of aged compost and peat moss. Fill the hole with water and allow it to drain. Remove the tree from the container that it is currently in. Loosen its roots by gently pulling them away from the root ball with your hands. Examine the roots. Use a sharp pair of pruning shears to prune any that are broken or any long, thin roots that have wrapped around the interior of the container. Use the amended soil to plant the tree in the hole so that it sits in the hole at the same level that it sat in its original container. Do not cover the top of the tree's roots with more than 1 inch of soil. Pat the soil down with your hands when you are done to settle it and remove any air pockets. Water the tree so that the planting site is moist to the depth of the bottom of the tree's root ball. The best way to do this is to lay a slow-running hose near the base of the tree for roughly 15 minutes. Continue to keep the planting area moist by watering in this fashion two to three times a week (use your finger to check that the soil is dry 3 or so inches beneath the surface of the soil to make sure that it needs watering first) until the tree establishes itself and produces new growth. 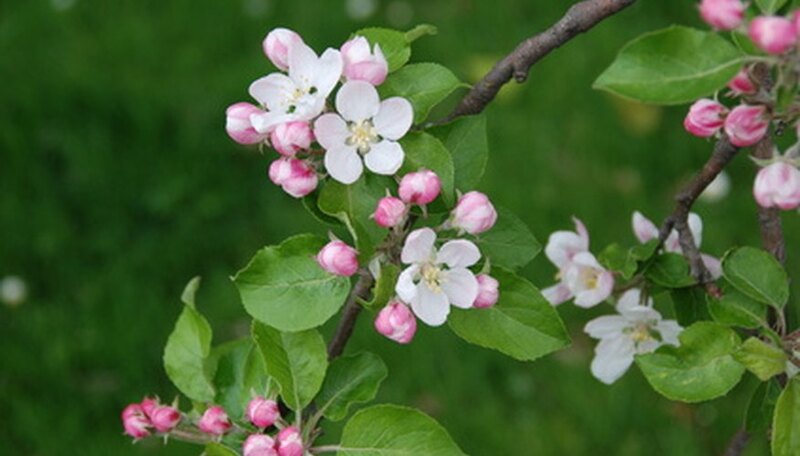 The crabapple coralburst should only be grown in growing zones 3 through 8. The best time to plant a crabapple coralburst is between mid-March and mid-April. Based in Houston, Texas, Meg Butler is a professional farmer, house flipper and landscaper. When not busy learning about homes and appliances she's sharing that knowledge. Butler began blogging, editing and writing in 2000. Her work has appered in the "Houston Press" and several other publications. She has an A.A. in journalism and a B.A. in history from New York University. How Fast Will a Whitespire Birch Tree Grow? How Fast Do Crabapple Trees Grow? What is the Growth Rate of a Holly Tree?